Calorex is the world's leading manufacturer of swimming pool heat pumps and is renowned for it's innovation, range and quality of products. A proud claim, backed by over 25 years of design, manufacturing and operational experience with thousands of units operating in hundreds of countries worldwide. Extended UK seasons usually considered are April-October and March-November. Heat pumps for these longer seasons are often refereed to as ‘extended season’ models. Occasionally, an all-year swimming season is preferred, which also applies to most indoor pools. Heat pumps selected for all of these longer swimming seasons are listed as ‘Extended Season’ models. To help with electrical demands, ‘soft- starts’ can be fitted (if necessary) to any of the units as an optional extra. This reduces the initial electrical current surge associated with compressors. Advice from an electrician may be needed prior to installation. Heat pumps can also be installed in conjunction with auxiliary pool heaters. Occasionally, design parameters may require a periodical ‘top-up’. This can simply be by way of a small in-line electrical element or calorifier. Aspects Pools will gladly advise with all such combinations. Equipment selection needs assessing for each season considered. Basically, warmer air temperature equate to lower heating demands, because a) pool water heat losses are less, and b) heat pump efficiencies are higher than those associated with cooler air temperatures. The diagram below shows performance efficiencies for various air temperatures. 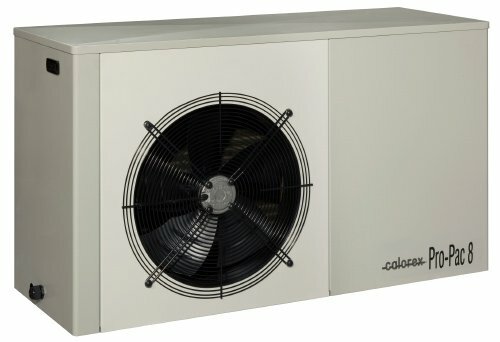 Calorex units are built to last and have been supplied to the swimming pool industry for decades. Thousands of Calorex units have been successfully operating in some thirty countries. The choice of materials for the components is aimed at a long reliable life. The cabinets are steel, first galvanised and then coated to provide resilient protection against external elements. Pool water heat exchangers are of high quality to ensure maximum resistance to pool chemical corrosion. All models now include a titanium heat exchanger with a five year warranty, plus digital controls. Each unit is thoroughly tested and inspected and must meet a precise performance standard before leaving the factory! The Calorex factory and products are approved to several internationally accepted standards of quality and safety. All Calorex equipment is fully guaranteed and dispatched complete with comprehensive instructions.